It received it from the Ecumenical Patriarch in Istanbul. 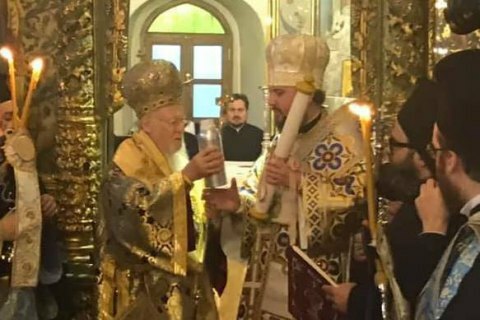 Ecumenical Patriarch Bartholomew has handed the Tomos on the autocephaly of the Ukrainian Orthodox Church to Metropolitan of Kyiv and All Ukraine Epifaniy. The ceremony took place in the St George Cathedral in Istanbul on the morning of 6 January. The transfer of the Tomos completes the creation of the independent Ukrainian Orthodox Church. Ecumenical Patriarch Bartholomew signed the Tomos for the Ukrainian Church on 5 January. Apart from Epifaniy, the Ukrainian delegation to Istanbul includes President Petro Poroshenko parliament speaker Andriy Parubiy, former President Viktor Yushchenko, Defence Minister Stepan Poltorak and other government members. On 7 January, Epifaniy will hold a Christmas service in Kyiv's St Sophia Cathedral.